Sorghum is a drought-tolerant crop and thus an important food source in semi-arid regions of the world. The area under sorghum production has declined from 18 million ha in 1970 to 6.98 million ha in 2009–10. This decline is more prominent in kharif (rainy) season than in rabi (post-rainy) season. The consumer demands in food production have changed considerably in the last three decades. It is believed that food is not only required to provide necessary nutrients but also to prevent nutrition-related diseases and improve physical and mental well-being of consumers. Sorghum products are being promoted for their positive health benefits by the Directorate of Sorghum Research under the National Agricultural Innovation Project (NAIP). This promotion aims at rural income augmentation and employment generation through post-harvest processing, value addition, and development of rural agro-industries. I appreciate the collaborative efforts of the authors in bringing out this valuable publication. It will be an important reference book for planners, policy-makers, plant breeders, socio-economists, and nutritionists alike to devise steps to enhance the production, consumption, utilization, and marketing of sorghum. • There is a prior awareness on jowar being a healthy and nutritious food. • Good response for quality certification from NIN. • Strong research and development facility is available. • DSR's brand ‘Eatrite’ is the only brand in the market offering versatile product range based on jowar. • Easy to be adopted in terms of appearance, preparation, and taste when compared with traditional products. • Taste of the product was liked by the respondents. • People are willing to consider the product if ‘Eatrite’ is launched in the market. • New brand in the market. • Lack of awareness about the product among the non-traditional respondents. • Lack of commercial business operation and good sales/distribution network; and there is limited presence in the market. • Immature economy of scale. • Lack of promotion of the product. • Shelf-life of the product is short (one month). • The typical smell of jowar is disliked by the non-traditional consumers. • Difficulties are encountered in the preparation/cooking of jowar by urban consumers. • Appearance of the jowar is inferior as compared with the traditional product. • Growing willingness in consumers to try new products with health benefits. • Diabetic and obese consumers are happy with the product having major health benefits for them. • A good substitute for traditional products in terms of variety. Food processing in all the sectors involves the conversion of raw material into a finished end-product of higher value to consumer. In some situations, processing is a one-step conversion of raw material to a consumer product. The history of food processing emphasises on establishing and maintaining microbial safety, as well as economic shelf-life of the food. All developments in food processing have similar origins. One common aspect is achieving and maintaining microbial safety in the product. Food processing methods are used worldwide as they improve nutritional quality of the grains, digestibility, and shelf-life. Food processing operations mainly involves primary and secondary processing steps. Primary processing is a crucial step to maintain the quality of grain, which is a vital consideration in ultimately ensuring the quality of processed foods. In this process, stones, sand, dust, hay, glumes, animal excreta, and other foreign matter are removed. Grading and sorting are usually employed that aid in the removal of oversize, undersize, immature or poor quality grains. Secondary processing is a set of operations, wherein the processed raw material obtained after primary treatment is converted into ready-to-eat (RTE) and ready-to-cook (RTC) products. These finished products minimise the cooking time and are used as convenience foods. Sorghum, the indigenous millet, is a traditional staple food in Africa, India, and other Asian countries. The consumption pattern of sorghum is quite traditional, and sorghum is not available as commercially processed food in the Indian market. This is due to lack of processing technologies, inavailability of machinery, and inconsistent grain availability. In semi-arid regions, dehulling and milling are done by hand pounding, and unfermented baked food and fermented food are used to prepare sorghum-based food. The consumer acceptability test is conducted under the study titled ‘Sorghum: An Emerging Cash Crop: Consumer acceptability of processed RTC/RTE Health foods’. The core objective of the study was to understand the following parameters: consumer behaviour on the acceptance of the products, consumer profiling with delineation of specific target segments in selected cities, advising on positioning, providing inputs on branding, communication strategy, pricing, and distribution strategies. The study was conducted for five jowar-based food products, namely, jowar-rich multigrain atta, jowar vermicelli, jowar rawa, jowar flakes, and jowar biscuits. The cities chosen for the study were Hyderabad, New Delhi, and Pune. Based on the statistical significance level, respondents/samples from over 400 household were covered in each city. Except jowar biscuits, all other products require cooking prior to consumption. Each household was provided with a sample kit containing jowar-rich multigrain atta, jowar vermicelli, jowar rawa, jowar flakes, and jowar biscuits. Information on various factors was collected from the respondent in two stages, factors being packaging, product attributes before and after cooking, and experience while preparation and consumption. A structured questionnaire was used to get the information. In Stage-1, information pertaining to demographic profile (age, family size, dietary preference, income level, number of employed members, number of children, number of elders, and occupation of the lady members of the household) was collected. As per the stated objective, the study required conducting a primary survey among the households in Hyderabad, New Delhi, and Pune. The consumers were provided with a sample kit (containing five jowar-based products like multigrain atta, jowar vermicelli, jowar flakes, jowar suji/rawa/semolina, and jowar biscuits) and were advised to evaluate the product on the parameters like packaging, physical appearance, and other cooking and consumption parameters like the product attributes before and after cooking, and experience encountered while preparation and consumption. The feedback of the consumers on various factors was captured through a structured questionnaire. The consumers provided their acceptability rating on the product attributes, including packaging, appearance, colour, smell, texture, preparation process, taste, etc., during both raw as well as cooked forms using 5-point hedonic scale (5 = Liked very much, 4 = Liked moderately, 3 = Neither liked nor disliked, 2 = Disliked moderately, and 1 = Disliked very much). Consumers rated prior awareness on jowar and its benefits and their decision to purchase or not on binary (yes/no) scale. A combination of random sampling and partial judgement sampling method was adopted for the selection of the respondents because of following two criteria. a. The targeted respondents belonged to households/families. Other segments of population such as bachelors/caterers were also covered, though at a minor level. b. Certain segments were deliberately left out like slums, BPL population, and highly affluent class so as to avoid skewedness in the sample. Respondents were classified into four groups/segments, based mainly on socio-economic status comprising income level, education, food habits, etc. The criteria for the sample selection included higher-income group, higher middle-income group, middle-income group, minority groups, and food habits (vegetarian/non-vegetarian). Sorghum is a traditional staple food in India. The consumption of sorghum both in urban and in rural areas has been on the decline for various reasons – easy access of other cereals like rice and wheat, tedious and time-consuming processes involved in preparation, urbanisation, and Government policies to supply fine cereals at a subsidized rate. However, sorghum is preferred by nutritionists over other cereals for its high fibre content and slow-releasing carbohydrates and minerals. Thus, it facilitates in dietary management and in preventing metabolic diseases. It is highly recommended for all age groups especially for those suffering from lifestyle diseases such as diabetics and obesity. Therefore, there is a need for diversification of processing technology that makes sorghum products both value added and convenient. The current study is part of a series of outputs of the National Agricultural Innovation Project (NAIP) focusing on Millets Value Chain headed by the Directorate of Sorghum Research (DSR). Sorghum and millets are the future crops offering nutritional security owing to their nutritional superiority over other fine cereals such as rice and wheat. The consumer acceptance report of Hyderabad, Pune, and Delhi shows that sorghum products are quite popular in market. 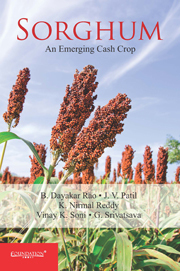 This book discusses the status of sorghum production and its consumption in India. It also talks about the strategies to exploit the nutritional value of sorghum, and market point of view. I thank the authors for their sincere effort to write this book. A common rule of thumb for dropping the least important factors from the analysis is the K1 rule. Factors with more than 1.0 as Eigen value were selected. A Cattell Scree test plot tool was also drawn to justify the extent of component to be selected. On the benchmark measuring point of 0.600, the reliability of the data and consistency in the responses received for factors were explained as at what extent the data is reliable or consistent. The test could not be conducted for those factors that consist of independent variables and responses in different scale or binominal. Organoleptic: This is the most important dimension identified by the respondent. This deals with the physical attributes and organoleptic characteristics of the product. Physical attributes include product appearance in raw form as well as during the preparation (cooking) form and finished form. Organoleptic attributes also include sensory aspects (cooked), appearance, test, aroma, texture, etc. Prior awareness on health and other benefit of jowar: This dimension includes awareness about the consumption of jowar and benefits/perceptions attached with it. Awareness on nutritional benefits, ease of digestion, good source of energy, modern food, etc., are the parameters grouped in this dimension. Comparison of jowar-rich multigrain atta with traditional wheat atta: The comparison of jowar-rich multigrain atta with traditional wheat on the basis of difficulties in preparation process and taste is the major attribute included under this dimension. Sorghum, an important cereal crop, is the staple diet of over 500 million people in 30 countries. It is the main source of income for many farmers dwelling in semi-arid regions in India. However, the area under sorghum cultivation and its production have been on the decline during the past four decades. The reasons behind this decline are manifold - people's consumption habits, easy access to other popular cereals, government policies to supply fine cereals at a subsidized rate, the cumbersome process of preparing roti/chapati, etc. This book provides all important information about sorghum production from an agricultural point of view. Written by leading experts on sorghum, it covers the classification, consumption type, various ways of processing the grain, and also health benefits of the crop. It focuses on the potential market of sorghum, consumer acceptability of processed ready-to-cook/ready-to-eat foods made from sorghum, and pricing strategy. The book would be of interest to students of agriculture and researchers working on sorghum farming in India. Planners, policy-makers, entrepreneurs, and people working with food processing industries will also find it useful. The statistical analysis was conducted using the SAS statistical software program. Frequency distribution analysis was primarily done to evaluate the characteristics of the respondents and summarising their profile. Then, more than 40 per cent product-related attribute's responses were analysed under exploratory factor analyses (EFA) with varimax rotation to reduce the items to a smaller, more parsimonious set of variables. Eigen value higher than 1.0, and factor loading scores were used to identify the number of factors to extract. Kaiser-Meyer-Olkin (KMO) measure of sampling adequacy test was done to find whether factor analysis data was appropriate within the value that falls between the ranges of being great and appropriate of factor analysis data. KMO should be 0.60 or higher in order to proceed with factor analysis. Bartlett's test was done with the result, which indicates a highly significant result with P = 0.000 (P < 0.05) and therefore factor analysis is appropriate and accepted. Reliability of the extracted factor was assessed to examine the internal consistency of the result measurements. The reliability test was conducted using Cronbach's alpha value of 0.91 and a significance level of 0.000. The tool can be used to assess the data on Likert scale only. Due to this limitation the factor related to socio-economic and demography could not be assessed, as many of these variables were numeric. Also, a cluster analysis exercise was carried out to group respondents into clusters based on their responses. Respondents within a cluster have a high degree of similarity, while respondents between clusters are unique. This way, cluster analysis would help us know the differentiating factors between clusters. Additionally, significant differences were identified for the cluster based on Chi-square tests and t-tests. Sorghum is a tropical grain grown primarily in semi-arid parts of the world. In Africa, a major growing area runs across West Africa south of the Sahara, through Sudan, Ethiopia, and Somalia. It is grown in upper Egypt, Uganda, Kenya, Tanzania, Burundi, and Zambia. It is an important crop in India, Pakistan, Thailand, central and northern China, Australia, the drier areas of Argentina and Brazil, Venezuela, USA, France, and Italy. The crop is spread over the drier areas of the world; it grows better when the weather is dry and cool. Sorghum is a staple food for about 300 million people worldwide. Globally, sorghum is cultivated in an area of 42−43 million hectares leading to a production of 59−60 million tonnes of crop. In the last 18 years (1994−2011), average production of sorghum in the world is pegged at 59−60 million tonnes. The compounded annual growth rate (CAGR) in global production of sorghum has slightly declined by −0.5 per cent. The global production trend of sorghum is given in Fig. 2.1. United States is the largest producer of sorghum in the world. Annual average production of sorghum in the country during the year 1994−2011 was about 11.9−12.0 million tonnes. The compounded growth during these periods was −4.3 per cent annually. India is the second largest producer of sorghum in the world; on an average, the country produces around 7.5−7.8 million tonnes of sorghum annually. Nigeria ranks third and Mexico fourth in terms of the production of sorghum globally as the average production of sorghum during the year 1994−2011 in these countries was 7.68 and 5.94 million tonnes, respectively. Table 2.1 gives the production of sorghum in various countries globally. • The market size of the multigrain atta is very small as compared to the normal atta market. • The market is estimated to be around 15,000−25,000 tonnes per annum (on an average 1−1.5 per cent of total packed atta industry in India). • Mostly organised players dominate the segment and national brands are available in the market. • Few regional players are also there in the market. • Multigrain atta is sold at a premium (Ashirvaad, Pillsbury, Saffola). • Growth of this particular segment is estimated to be 3−4 per cent annually. • Biscuit industry size is estimated to be about 25−30 lakh tonnes per annum (Indian Biscuit's Manufacturing Association [IBMA]). • About 55−65 per cent of the total volume catered by the organised players. Glucose biscuits constitute 45−50 per cent of the market, followed by Marie that forms 10−15 per cent of the total biscuit consumption basket. • Share of cookies is estimated at about 3−4 per cent of the total market size. • Growth of the overall biscuit sector has been estimated at about 12−15 per cent per annum (IBMA). • Indian vermicelli market size is estimated at about 30,000−40,000 tonnes per annum (Source: Pasta Manufacturer Association India 2009/10). • The organised players handle 75−80 per cent of the total volume. • Regional brands dominate in their respective regions. However, few popular regional brands like Bambino and MTR are also available in other markets. • The sector is estimated to grow by 15 per cent annually (including pasta).